Children's vintage fabric is so perfect for a sweet little girl. Darlene Zimmerman has captured the sweetness in this beautiful vintage fabric panel. The panel measures 27 x 44 inches. The doll blocks measure 10 inch square and the doll house block measures approximately 20 inches in length by 10 inches wide. 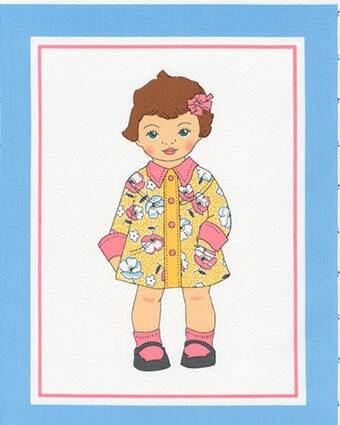 Each doll block features Dolly Jean dressed in adorable vintage clothing. 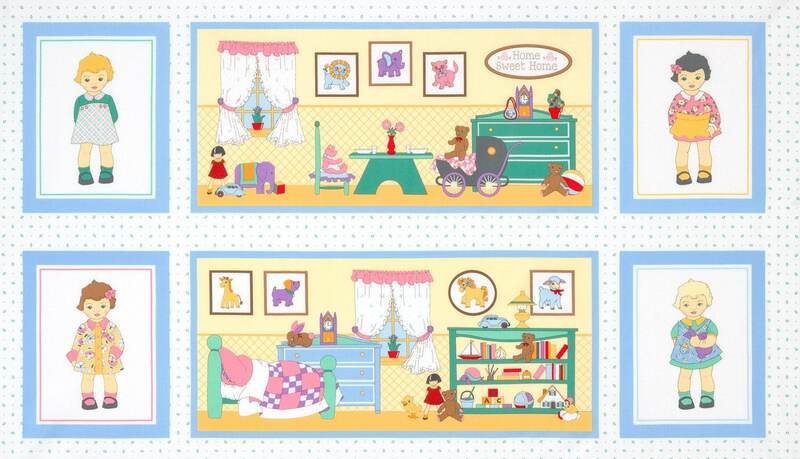 The doll house blocks features a fun little girls nursery. Dolly Jean measures approximately 6 1/2 inches in height and approximately 3 inches wide. These beautiful blocks are set on a beautiful sharp white with green geometric designs and the blocks are all outlined in a beautiful pastel blue. You will find beautiful pastel shades of yellow, pink, lavendar, green and blues. Every little girls deserves something so special created using this great panel. Click below to receive a free pattern download from Robert Kaufman. All fabric from The Quilted Nursery Children's Fabric Store is cut directly from the bolt in continuous yardage unless otherwise requested. The Quilted Nursery now offers fractional yardage cuts for your shopping convenience. Same day shipping always!